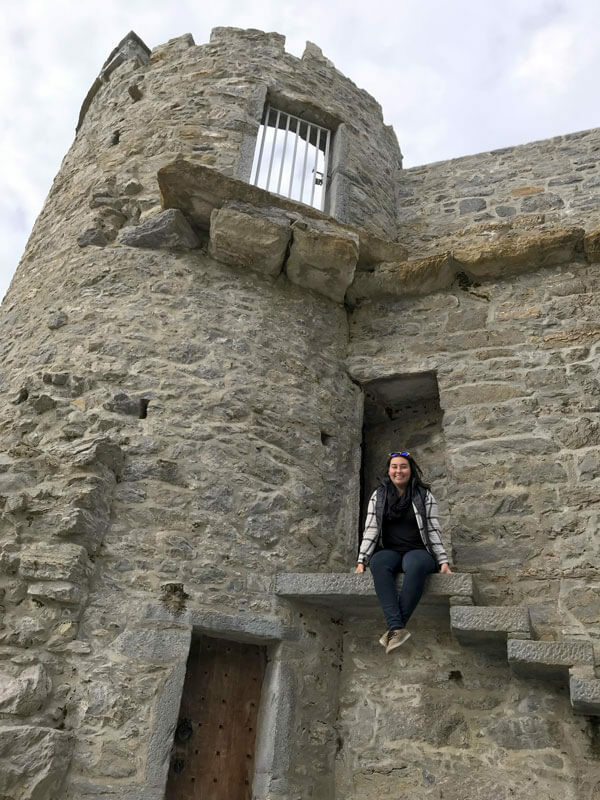 Planning your Ireland itinerary can be a bit daunting when there are so many beautiful places to visit in Ireland but have no fear dear reader, I’ve got you covered. 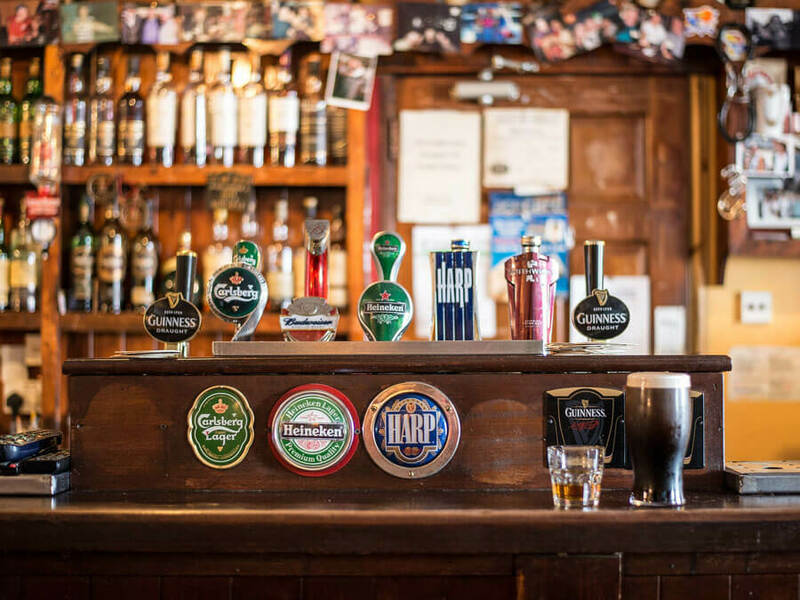 It may not be the most budget-friendly country but once you step off the plane and experience the pub culture and see some of the scenery then you’ll be happy that you chose to spend time in Ireland. The lush green landscape will steal your heart and the live music and pub food will warm your soul. Ireland is a special place and many people end up returning to the Emerald Isle. I can’t blame them! 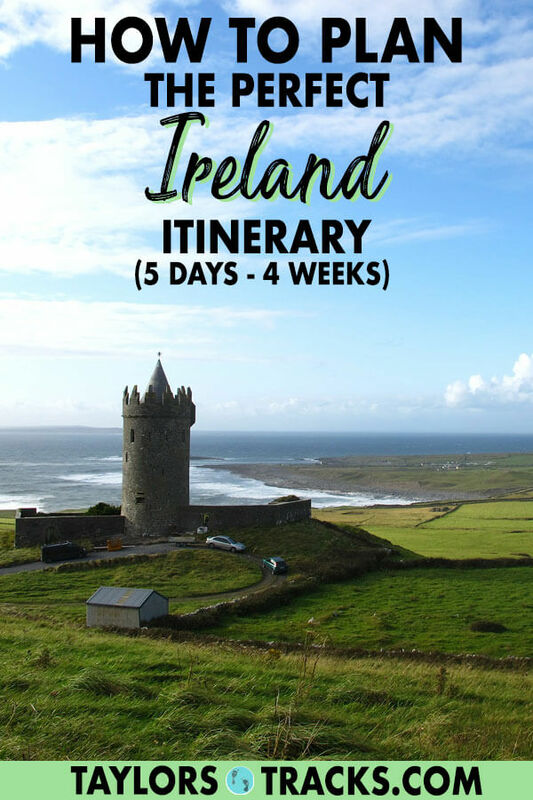 This Ireland travel itinerary is packed with Ireland travel tips and is designed to help you create the ideal itinerary for you, whether it be a self-drive Ireland itinerary or an itinerary to help you get around by train or bus. I’m your virtual Ireland trip planner! 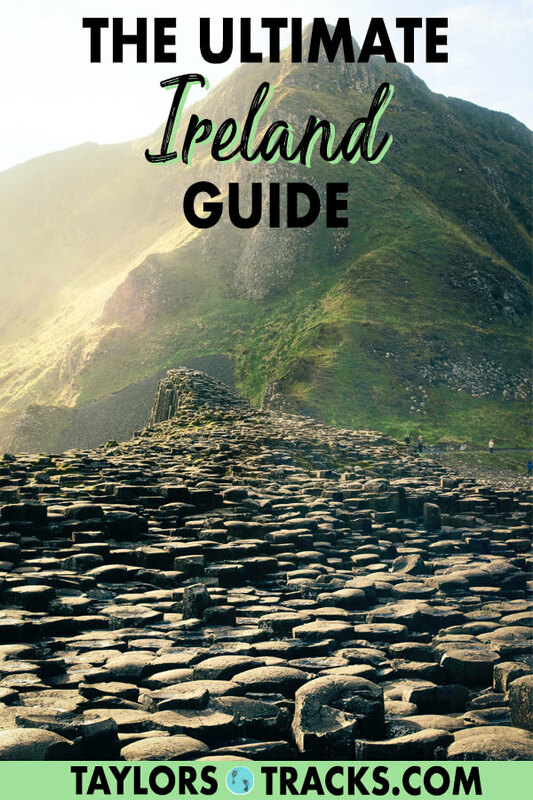 But first, this Ireland travel guide gives you all the details you’ll need to know to before you go and exactly how to plan a trip to Ireland. Then we’ll get into the places to visit in Ireland, the details on actually planning a trip to Ireland, what to see in Ireland and some of the best Ireland tours that you can take. 9 How Long to Spend in Ireland? The Ring of Kerry is one of the top things to do in Ireland. The first thing you need to know is that Ireland is two countries. What? Yeah, I didn’t know this for the longest time! The island is in fact divided with the majority of the island being the Republic of Ireland which is an independent state while a small part of the island is Northern Ireland which is apart of the UK. Ireland has mild weather year-round though the best time for the warmest weather is the summer months of June through to August. Temperatures will range from 9°-19°C. However, spring and fall are the best time of the year to visit Ireland as prices for airfare and accommodation are lower. Both seasons also have plenty of festivals across the country. The temperatures will still be cool so be prepared to bundle up in a few layers and bring a scarf. Keep in mind that parts of Ireland will close down in the slower seasons so if there is somewhere you must-see then be sure to check that the area or attraction will be open and allow visitors. 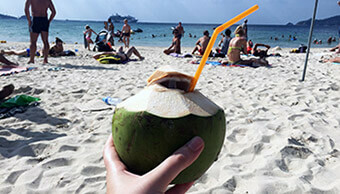 Avoid winter, it is the coldest season and has the most rainfall but you could score a great deal on airfare. An Ireland road trip itinerary should always include the Gap of Dunloe in Killarney. I’m going to be honest with you…Ireland is going to eat all of your budget and probably more. 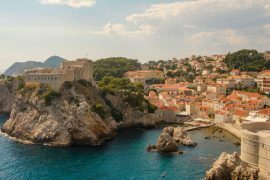 It’s not a cheap country but that doesn’t mean that there aren’t ways to save money while travelling through this gorgeous country. If you love to drink it will hurt to see how much you spend but a few Guinnesses here and there is not going to kill your budget as Guinness is one of the cheapest drinks in the country. A rough idea of a low daily budget for Ireland is USD$50 (40 euros). This is if you are staying in hostels, not renting a car and cooking most of your meals. I spent a month in Ireland and it worked out to be about $66 (54 euros) a day and I never once cooked for myself! 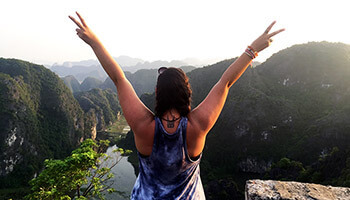 I stayed in hostels, took buses, walked as much as I could, was able to do plenty of day tours within this budget and had a number of big nights out. If you plan on staying in hotels your budget will more than double. The same goes if you eat out at restaurants instead of mainly budget options. 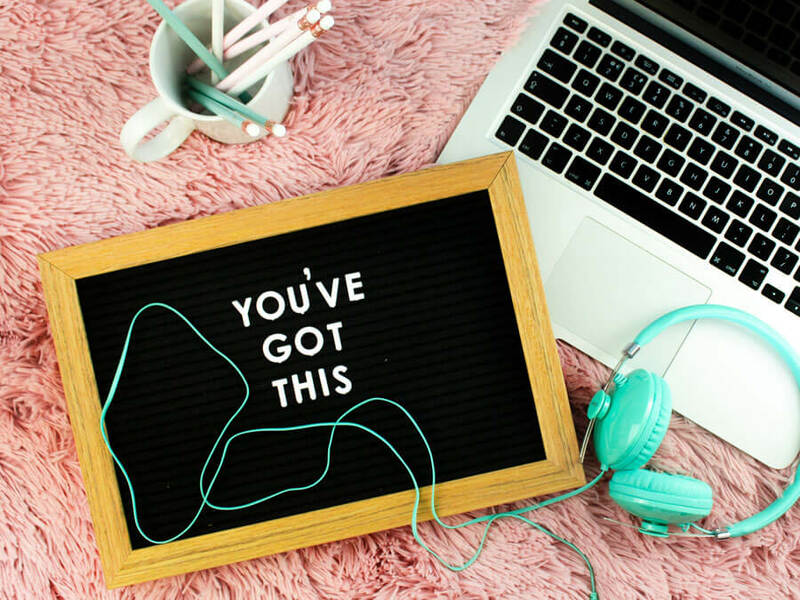 To get a better idea of what to budget for yourself, accommodation will cost 15-30 euros a night for hostels, the average hotel is 124 euros, fast food is as cheap as 4 euros but sit down meals cost typically 10-20 euros. Ireland bus tours range from 25-50 euros, long-distance buses can cost 15-30 euros, train are around 20-50 euros (they’re cheapest when booked in advance) and most of the cities are very walkable so save your money and avoid public transportation. Get ready to enjoy some great pub culture. It’s possible to get to Ireland by plane or ferry. Dublin is the cheapest city to fly into and there are often many flights deals to Dublin from Europe as well as North America. You can catch a ferry to Ireland from a number of ports in England, Wales, Scotland, Isle of Man, France and the Netherlands. You can find ferry companies and more information on the official Ireland Tourism site. Be sure to include the most eastern point in Europe, Dingle Peninsula in your Ireland trip itinerary! Getting around Ireland is very easy and you always have choices. 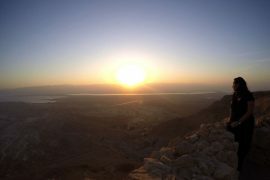 There are still parts of the country that are off the beaten track and can be more difficult to get to but all of the main sites and cities are easily accessible. Car: The best way to travel around Ireland is by car, without a doubt. You are free to do things at your own pace, avoid tours, see sites when there aren’t crowded and get to everywhere in the country. Unfortunately Ireland car rentals come with a heavy price tag, especially if you don’t drive manual. Keep in mind that the roads in Ireland are quite narrow, winding and you’ll need to drive on the left-hand side of the road! Train: Train travel in Ireland is beautiful, fast and mostly affordable. If you book in advance you can get a steal on the price but book last minute and you’ll notice a major price jump. Trains are comfortable, clean and equipped with Wi-Fi. In the Republic of Ireland train travel is run by Iarnród Éireann (Irish Rail) and in Northern Ireland trains are operated by Translink. Bus: The cheapest way to get around the country is by bus and they can easily be booked last minute for those of us who like to forget about planning. The buses are clean and affordable but it is also the slowest form of transportation. Ireland is a small country though so it never takes more than a few hours to get anywhere. In the Republic of Ireland buses are operated by Bus Éireann and Translink provides services in Northern Ireland. There are a few things that you will absolutely need while in Ireland. Reusable Water Bottle: In a country where water is drinkable and bottled water is expensive then having a reusable water bottle is a no-brainer for the environment and for your wallet. Rain/Wind Proof Jacket: This is essential for warmth in a country where you will probably see rain and wind everyday! I love this rain jacket because it’s longer (for extra warmth), it’s good for hiking, casual but the length also makes it a little dressier. These are the best places to visit in Ireland for your upcoming trip! 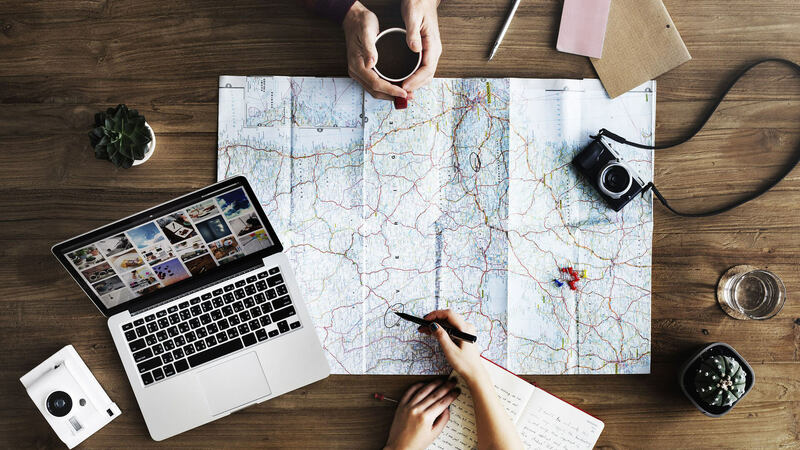 To help you decide where to go a description for each destination is provided below and sample itineraries based on how much time you have in Ireland. How Long to Spend in Ireland? To be honest, as long as possible! 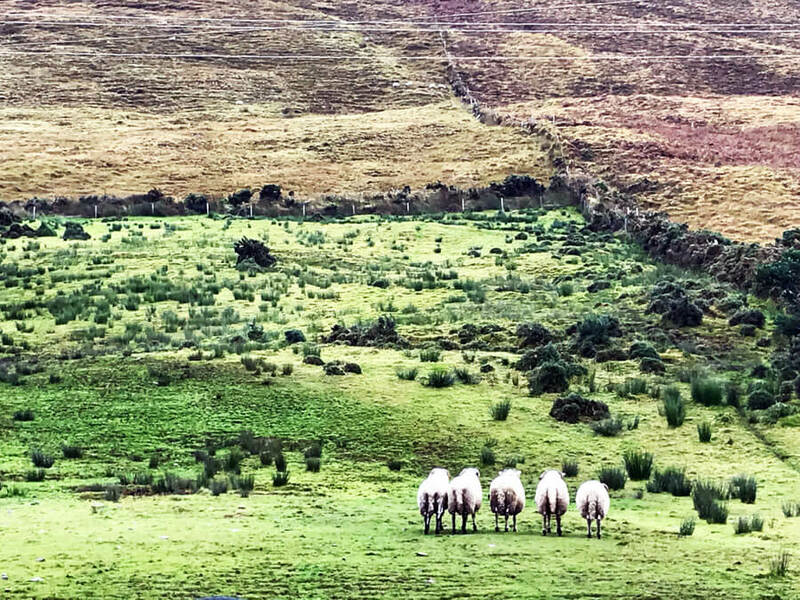 There truly is a ton to see in Ireland. I would recommend a week minimum but I know people often visit for as little as 5 days. 2 weeks in Ireland is better and 3 weeks will allow you to see most of the country if moving at a decent pace (2-3 nights in each destination). 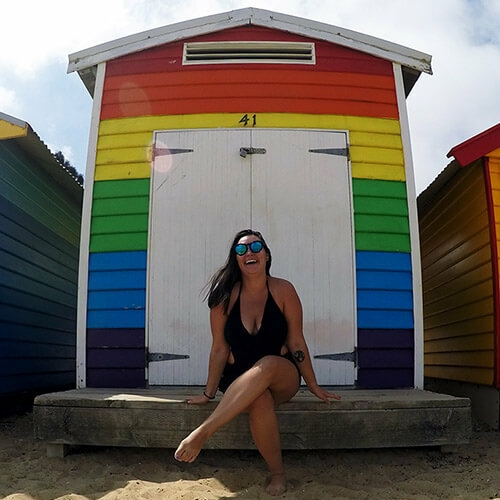 I personally spent a full month in Ireland and was able to each all of the places I’ve listed when travelling at a relaxed pace. A trip to Ireland is not complete with some Guinness. How this itinerary works: I recommend where to go in Ireland and the least amount of time to the max amount of time to spend in each destination. I share which Ireland travel destinations to pair together to help you decide and the best places to travel in Ireland for your allotted time. You can then mix and match which days appeal most to you to create the best Ireland itinerary between 5 days and 4 weeks. 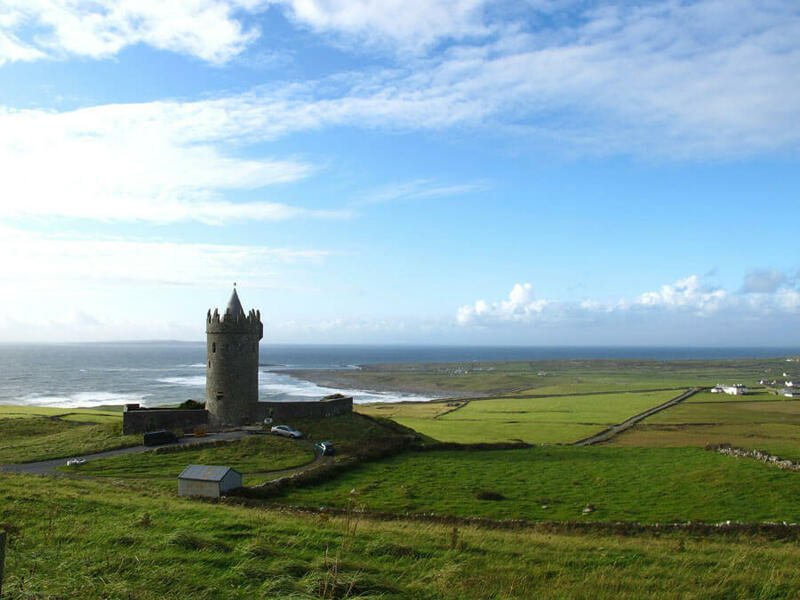 These trip ideas are designed for road trips and even as a backpacking Ireland itinerary. 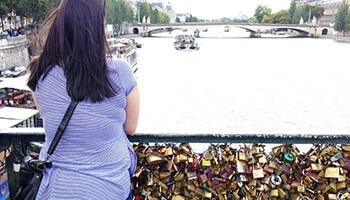 Choose an itinerary and start booking! The full itinerary will take you clockwise around all of Ireland. These are rough suggestions. Do research and look into how long it takes to get to each new destination as you might not want to move as fast. 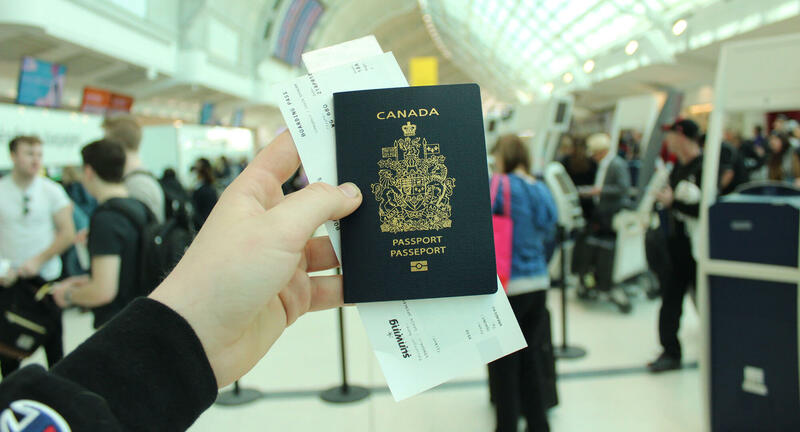 If you’re renting a car then hitting all the destinations suggested will not be an issue. All trips to Ireland should include some time in Galway. Ireland tourism always includes Temple Bar in Dublin. 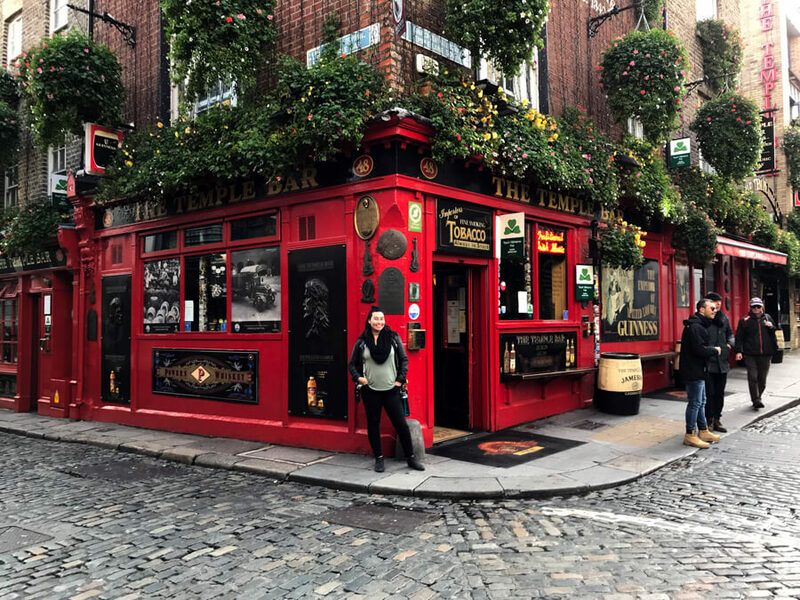 Dublin is the largest city in Ireland, the capital and the cheapest place to fly into so your Ireland trip will most likely have a stop in this famous city and I certainly wouldn’t advise you to skip it! 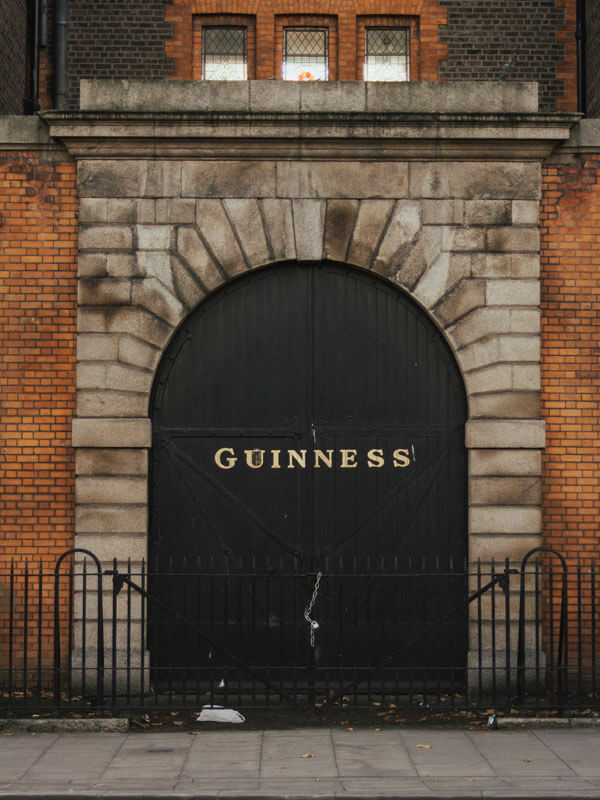 Dublin has a ton of history and many major attractions with most of them being drinking activities such as the Guinness Storehouse, the Jameson Distillery, the Whiskey Museum and of course pub culture (the oldest pub in Ireland is in Dublin!). But if drinking isn’t your thing you can visit one of the many museums such as The Little Museum of Dublin and the Natural Museum of Ireland. DAY ONE: The must-do activities in Dublin are a free walking tour to learn about the history of the city and see some of the top sites. Then a visit to the Guinness Storehouse or Jameson Distillery (though I recommend the Whiskey Museum!). DAY TWO: Make a stop at Trinity College where you can see the Book of Kells and the Long Hall which is a gorgeous library. If you didn’t on day one you have to walk through the Temple Bar area and grab a pint! 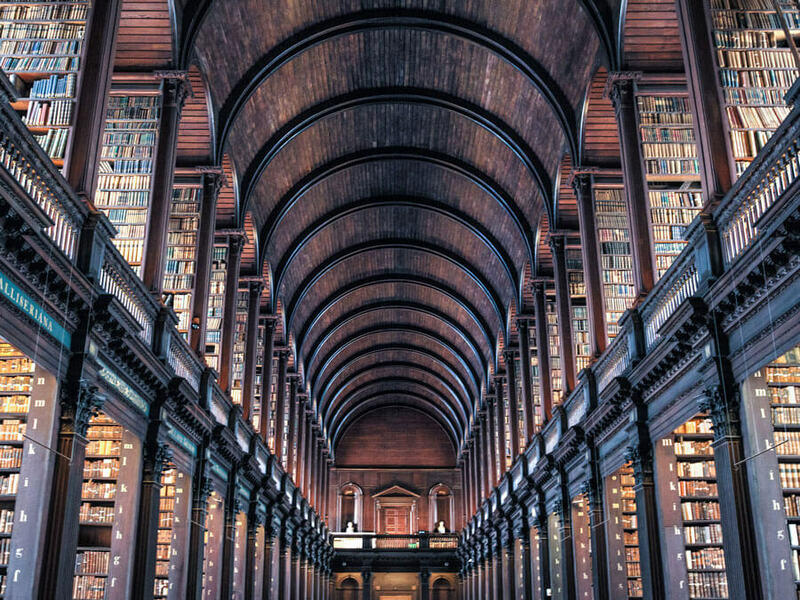 The Long Room at Trinity College in Dublin. DAY THREE: Add in a trip to Kilmainham Gaol, an abandoned prison with lots of stories (be sure to book in advance), visit a museum to kill some time while it rains, spend some time walking through the city’s gardens like Dublin’s National Botanic Gardens, St. Stephen’s Green or check out the Dublin Zoo. Lastly, you’ll also have time for some churches. DAY FOUR AND FIVE: Add in some recovery time (perhaps after a pub crawl), do a day tour to Kilkenny, Wicklow Mountains, Giant’s Causeway or Blarney. You could also try a food tour or even a beer tour! Pro tip: Many tours are offered from Dublin but some are very long days and not worth doing from Dublin if you’re spending time in a city that is closer! You’ll save money and time. 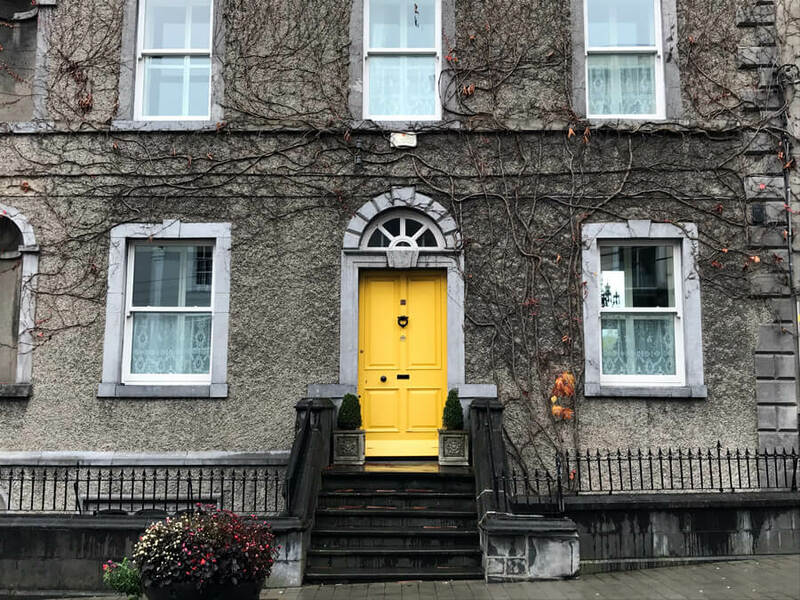 Ireland travel includes the cutest of doors. Kilkenny is a medieval town southeast from Dublin and is a great place to stop before getting to Cork. It can be a few hour stop to as much as 2 days if you’re more interested in medieval history. DAY ONE: The main things to do in Kilkenny are Kilkenny Castle (including the gardens and park), Saint Mary’s Cathedral which has breathtaking stained glass, St. Candice’s Cathedral and Round Tower for the best views of the city and the Black Abbey. Spend some time strolling along Medival Mile and you’ll find all of the main attractions, shopping and restaurants. Be sure to check out Kytetler’s Inn to hear the history of the building which includes witches and poisoned husbands. The food served is classic pub fare inside a pretty cool building! DAY TWO: And if you stay for a full 2-days stop by the Smithwick’s Experience for a brewery tour, join a theatrical walking tour of the city or try your hand at hurling, a Gaelic sport that is also the fastest in the world! One of the top places to go in Ireland: Blarney Castle. Cork is the second largest city in Ireland and is a university town. The city is worth a day or two stop before moving on to more scenic areas of Ireland. It is also a good base to catch some of Ireland’s highlights from if you aren’t road tripping. DAY ONE: Check out the city! Walk down St. Patrick’s Street which is lined with shopping, stop by the English Market for some delicious food, marvel at St. Fin Barre’s Cathedral and head over to the Cork City Gaol. If you have more time other highlights worth seeing are the Shandon Bells at St. Anne’s Church which you get to ring yourself, Fitzgerald Park or Blackrock Castle Observatory. DAY TWO: Is a trip to Ireland complete without kissing the famous Blarney Stone? I don’t think so. 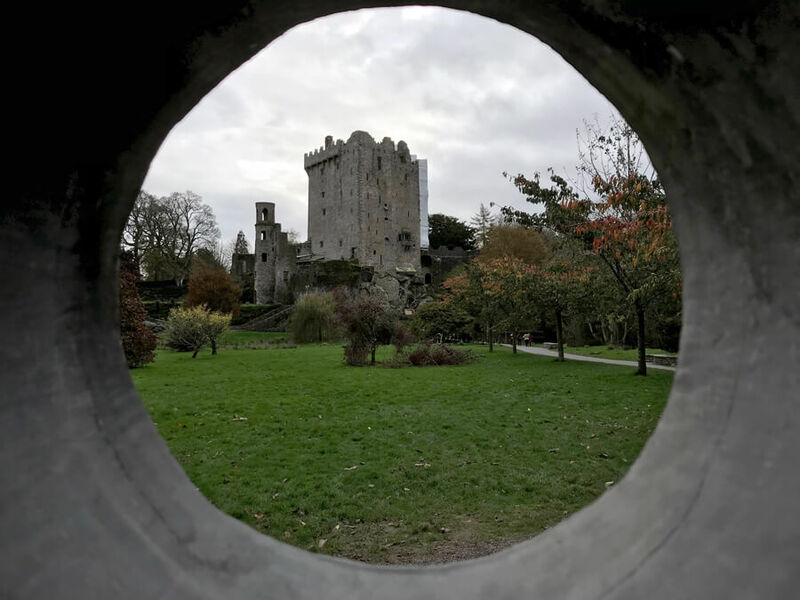 Pop on over to Blarney Castle where you can kiss the stone and roam the grounds through pretty gardens. Add in any sites that you didn’t get to the first day for half of day two. DAY THREE: If you’re driving be sure to make a stop before getting to Cork at the Rock of Cashel. If you’re not driving then day tours are available which I highly recommend as the Rock of Cashel was personally one of my favourite things to see in Ireland. Some of the best of Ireland is in Killarney. Killarney is a gem in Ireland and has so much to do! It became a tourist town thanks to a visit from Queen Victoria in 1861 which really put Killarney on the map as a must-visit destination in Ireland. It really is one of the best places to see in Ireland. It was also here that I fell in love with Ireland and where you can see much of the beauty from stunning landscapes. Killarney is also a great spot to set up base and explore some of the most popular areas attractions in Ireland if you’re not driving. DAY ONE: Spend some time in town where you can roam through the cutest streets popping into little stores to find beautiful decorations, handmade things and more. If you fancy a classic Ireland souvenier stop by the Aran Sweater Market (there is also one in Dublin, on Inis Mor and soon in Galway) where you can get a sweater made out of Ireland’s famous wool. Then you can make your way to Ross Castle in Killarney National Park. 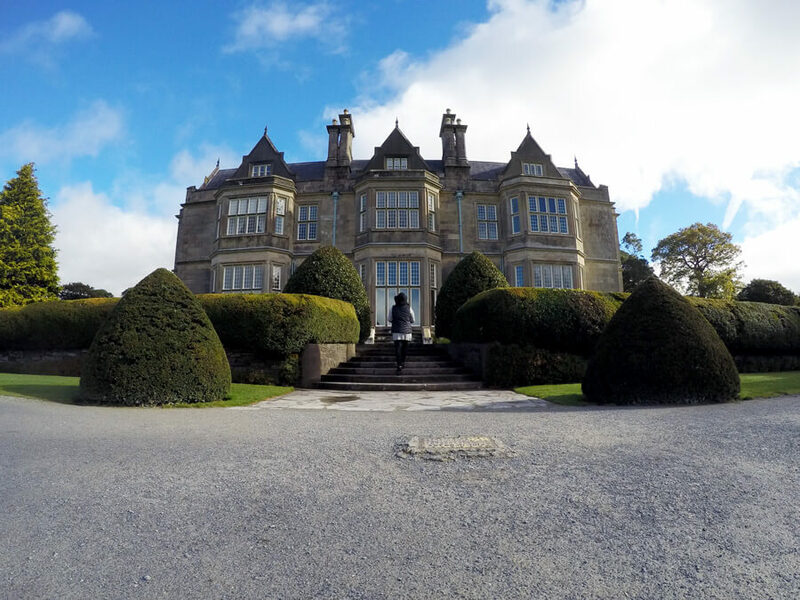 Be sure to stop by Muckross House and Torc Waterfall. Note: This may be tight to do all in one day if without a car so get started early! 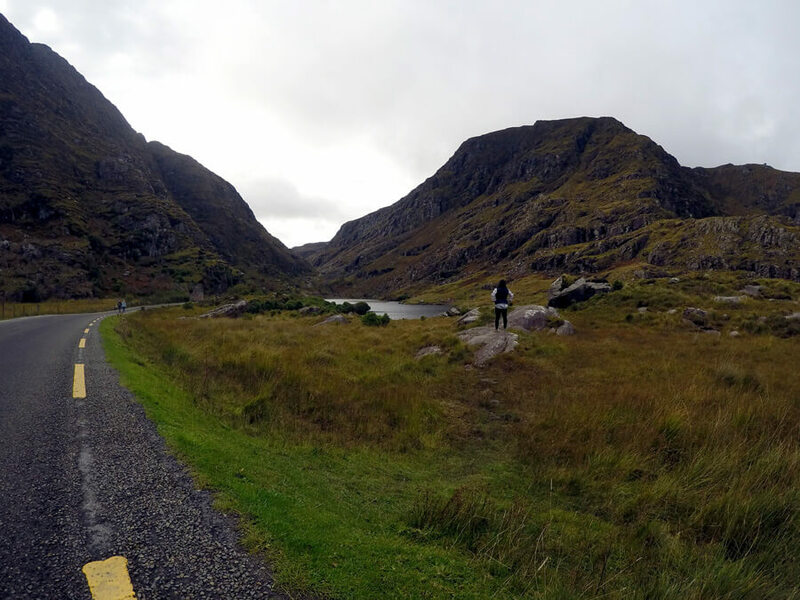 DAY TWO: You’re in for a treat this day with a trip to the Gap of Dunloe. You can choose to drive, walk or take a jaunting car (a carriage pulled by a horse). I recommend walking so you can take in the full experience of this stunning area, a passage between two mountains carved from glacial ice. Don’t skip this! DAY THREE: This is a driving activity, which can also be done by tour where you’ll get some of the most beautiful scenic views in Ireland. The Ring of Kerry is extremely popular and with good reason. Love castles? Ireland castle tours are available around the country. However, if the weather is cooperating then the views can be nonexistent. Be sure to make a stop where you can see how dogs are trained to herd sheep, it’s quite interesting! DAY FOUR: The Dingle Peninsula is another breathtaking drive with rolling mountains, including the tallest mountain in Ireland (Mount Brandon) and seaside cliffs. On this drive or tour you can see the town of Dingle itself where you absolutely must try Murphy’s Ice Cream as Dingle is where it’s made (if you miss it there is also one in Killarney). You can also stop at Dunmore Head, the most eastern point of continental Europe. The Dingle Distillery also has amazing whiskey, gin and vodka. DAY FIVE: Visit the Skellig Islands, which recently hit the spotlight as it is where one of the Star Wars movies was filmed (don’t ask me which one, I don’t follow Star Wars!). On a good day the islands can be seen from the Ring of Kerry. You need to take a boat to get to the island so tours are a must. Once on the islands you can see ancient history. 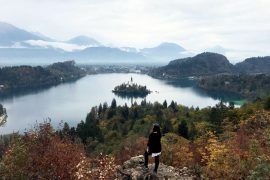 The larger of the two islands is a UNESCO World Heritage site are where you’ll find the beehive huts made by Christian monks to live in over a millinium ago. The smaller of the two islands is home to the world’s largest Northern Gannet colony as well as other seabirds (like puffins!) and it’s also popular for seal, dolphin and whale spottings. 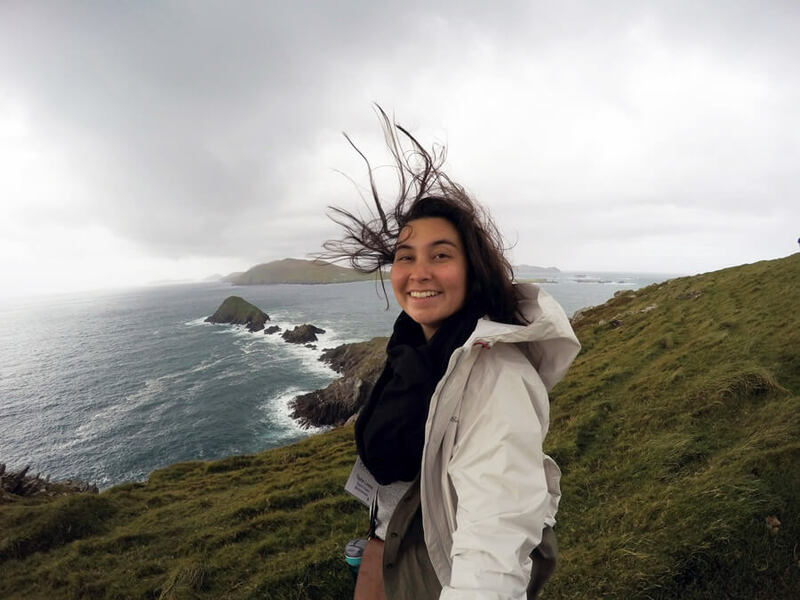 Pro tip: If you decide that you want to visit the Skellig Islands then make sure when visit in the right season as tours stop going to the islands for a good part of the year. 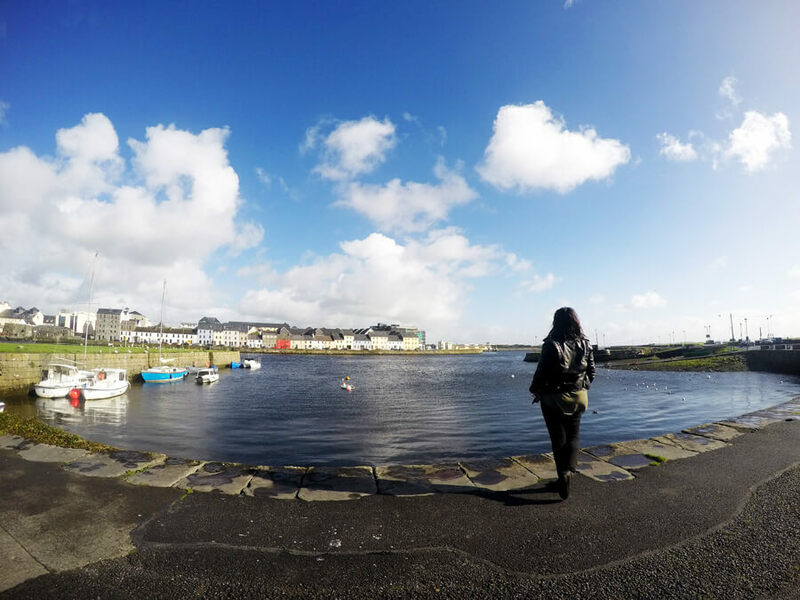 Ireland vacations should always include Galway. 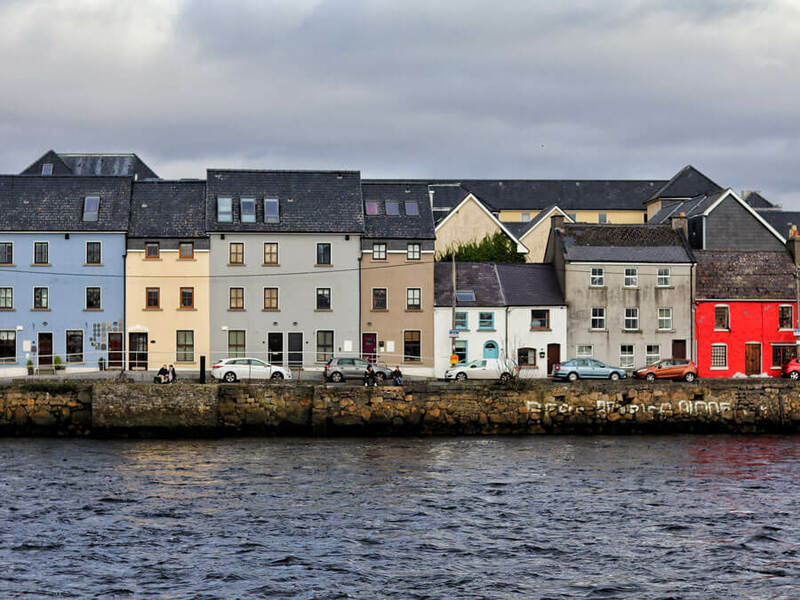 Galway is Ireland’s fourth largest city and is in my opinion Ireland’s best city for its charm, colourful streets and the things to do around the city. It is a harbour city on Ireland’s west coast and is packed with trendy cafes, traditional pubs and the streets are filled with talented musicians. Galway too is a good spot to set up base for some day trips or a shorter stop if you are driving. I don’t recommend anything less than 3 days here because of the trips you’ll want to take from here. If you love nightlife and just exploring the town then tack on an extra day for some more relaxation. DAY ONE: Make your way around the city. Free tours are available that teach you about the city’s history and take you to the main spots in town. Find your way through Eyre Square, past plenty of shopping and pubs to the Spanish Arc and the Galway Museum. Other mentionable places to stop are Galway Cathedral and St. Nicholas’ Church. If the weather is nice then a walk along the Salthill Promenade makes for the perfect afternoon. The Salthill beaches are popular for swimming because of their pristine cleanliness. If you want a Claddagh ring, this is the place to get one as they’re made in Galway! For the evening head to the Latin Quarter, the most popular area of the city for a night on the town. DAY TWO: We’ll start with a tour or drive from Galway to one of the most popular Ireland tourist attractions, the Cliffs of Moher. You’ve most certainly seen pictures of these cliffs and they drop straight into the Atlantic Ocean and reach a peak height of 214 metres (702 feet). 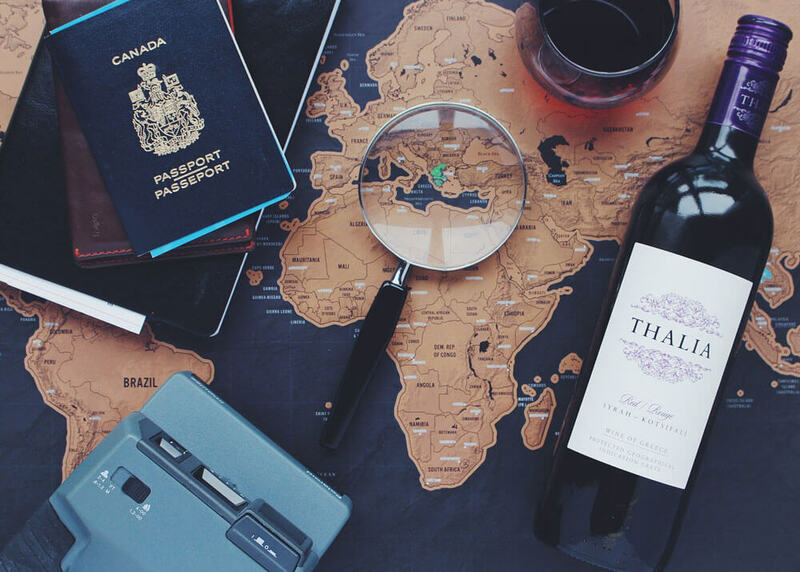 Get ready for some insta-worthy shots from here! DAY THREE: Another day tour from Galway is Connemara National Park. It’s a day filled with beautiful scenery as you drive or tour through the countryside stopping for picturesque views and photo opportunities. The beautiful Kylemore Abbey is one of the best day trips from Galway. 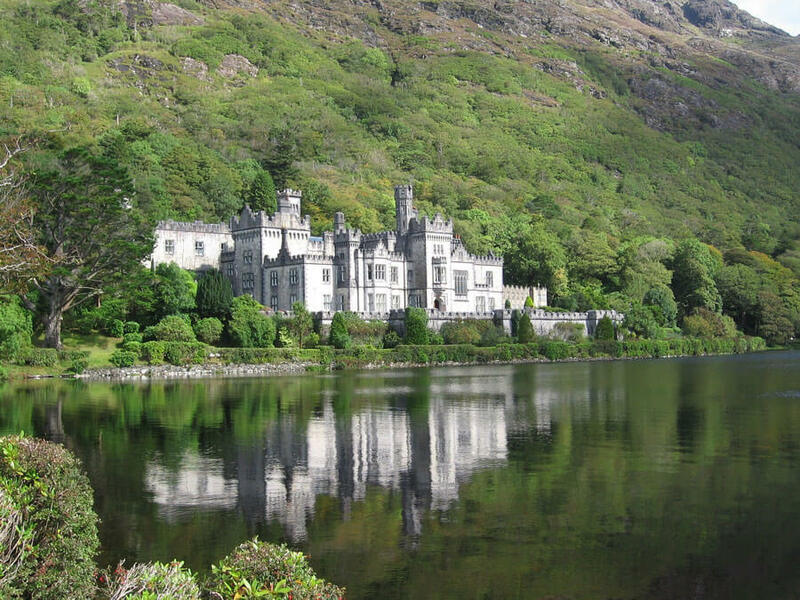 On a tour you’ll head out to Kylemore Abbey, dubbed the most romantic building in all of Ireland. You’ll also visit some noteworthy sites and ruins full of history and stories. You may even spot some Connemara ponies! DAY FOUR: Take a day trip to the largest Aran Island, Inis Mor (moe details below). From Galway you can purchase a bus and ferry combo ticket. Once on the island you can then rent a bike or a horse and carriage for the day to see the island. The Aran Islands are a group of three islands off of Ireland’s west coast that are known for their ancient sites, prehistoric forts, medevil ruins and rugged landscape. The largest of the three islands is Inis Mor (Inishmore) which is inhabited and where locals still speak Irish. But don’t worry English is understood across the island. The most popular visit to Inis Mor is a day trip from Galway, so if you are short on time this is the best way to see the island. However, if you have the time I highly recommend you spend a night on the island so you can spend more time exploring. There is one hostel on the island and a few hotels. A ferry ticket from Galway also includes a bus transfer and can also include a bike rental. Spend one day walking around seeing some of the medviel sites and forts and meeting the local animals (I met quite a few donkeys). 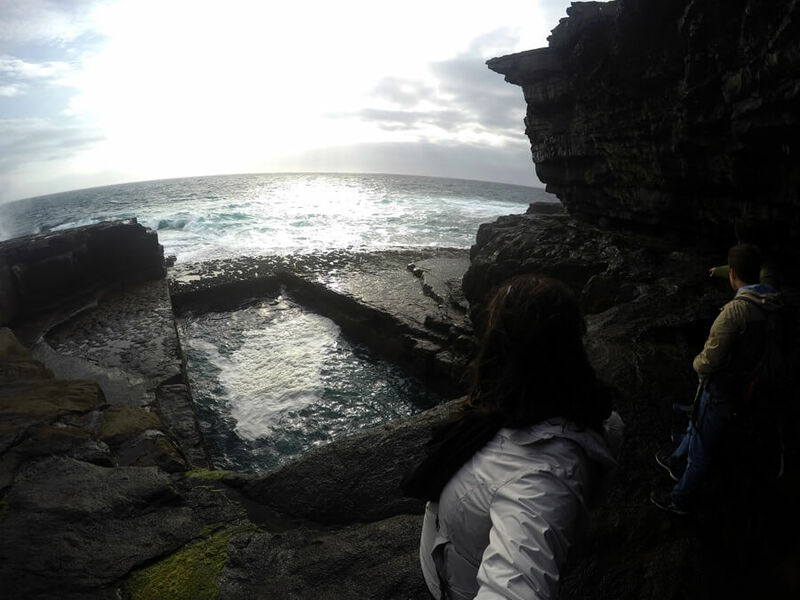 On your second day grab a bike and head out to the further sites such as the Worm Hole (pictured above) which is a natually shaped rectangular pool and where one of the Red Bull challenges was held. Just grab a map once on the island and you’ll be able to find everything! Sligo is a coastal town that attracts those who love to surf. There is not a whole to do in the town so I recommend a quick stop in here and keep moving on the same day or stay the night if you plan on surfing. The beach here is gorgeous and there are plenty of surf lessons available. Cute cafes line the beach and many pubs make up the town itself. Derry is the first stop in Northern Ireland! I’ll let you figure out why this city has two names once you get there. Londonderry is known for having a bit of a rough past and for the 17th century city walls that are still intact today. I won’t get into the details of the past as a local can do much better explaining the history of the events such as Bloody Sunday. DAY ONE: Take a tour of the city so you can see the best sites and learn the history, politics and more of the city. It’s important here to learn about it all so you can understand more about the city and Ireland as a whole. For the afternoon make your way around town, walking along the city walls if you didn’t do it on the tour. 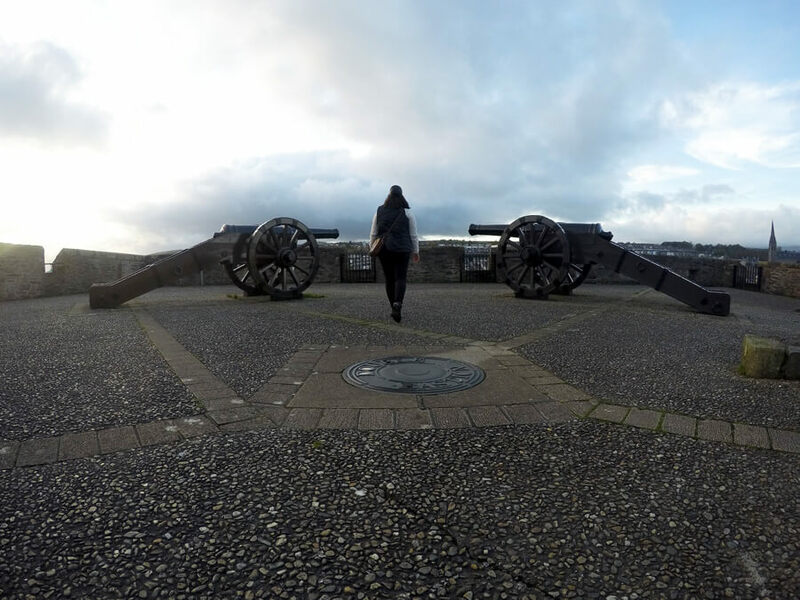 Visit sites such as the Guildhall, the Siege Museum, St. Colmbus’ Cathedral or the Museum of Free Derry. DAY TWO: If you’d like to know more about Bloody Sunday and the division of the city take the time to go on a walking tour of the Bogside with a local. I recommend Bogside History Tours as a local who has an intimate perspective leads the tour. You’ll see the Derry murals and get a discount on the Museum of Free Derry. Take the afternoon for anything you didn’t get to the first day. Pro tip: If you’re a whiskey lover be sure to pay a visit to the Bushmill’s Distillery in Bushmills which is about halfway between Londonderry and Belfast. A trip to the distillery can be done as a tour from either city. Belfast is the capital of Northern Ireland and where the Titanic was built. This edgy city is absolutely incredible and like Londonderry has a troubled past. It’s here that you should spend even more time learning about The Troubles but also enjoy the unique atmosphere that this city has to offer. It is one a kind and I personally think it is one of the best places to visit in Ireland! DAY ONE: Get acquainted with the city by doing a free walking tour where you can take in the city’s sites, learn about The Troubles and understand some of the insane history behind the buildings (like the most bombed hotel in Europe, The Europa). After the tour head over to the Titanic Museum. I won’t sugar coat it, it is an expensive museum to get into but it’s worth it if you’re a Titanic fan. If not then you should at least walk over to see the building as it’s quite interesting. Be sure to check out St. George’s Market, an indoor market filled with food stalls, handmade goods and live music. Spend the rest of the day walking around the city where you can visit other sites such as St. Anne’s Cathedral. Be sure to stop by Kelly’s Cellars which isn’t far from the cathedral for a pint as it is a good mix of locals and visitors. 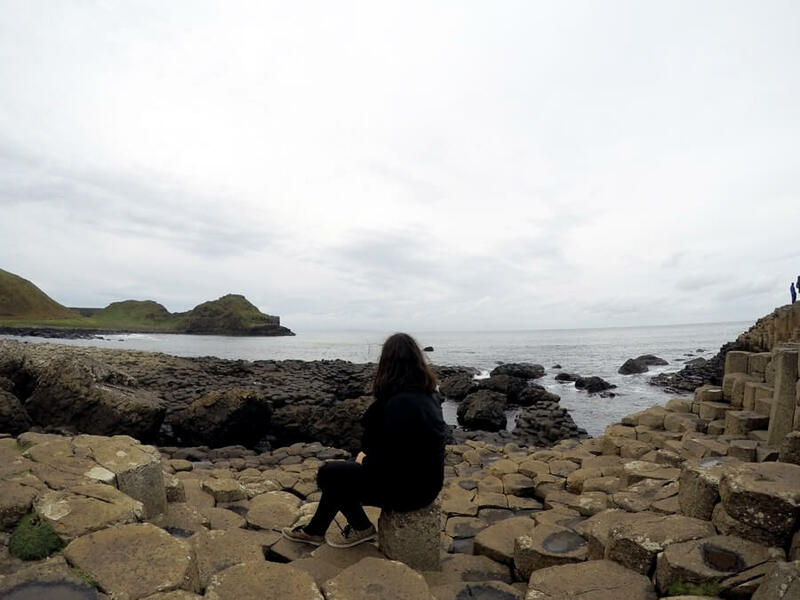 DAY TWO: A trip to Northern Ireland isn’t complete without visiting the well-known Giant’s Causeway, a UNESCO World Heritage Site made up of interlocking columns as a result of an ancient volcanic eruption. Take a day trip or a drive up the Antrim Coast where you’ll be awed by the views and get so close to Scotland that you can see it from Ireland. Day tours often also include a stop at the Carrick-a-Rede bridge, a rope bridge suspended 30 metres above the water and rocks below and connects to the tiny island of Carrickarede. Some tours will also include a stop at the dark hedges where a scene from Game of Thrones was filmed. DAY THREE: Back in the city it’s time to explore more of Belfast’s past. One of the best things to do in Belfast is a black cab tour where a local will take you around town explaining the rough history, showing you both sides of the wall and some of the most famous murals in the city and why there were painted. You can also do a 3-hour walking tour for a more in depth look. Belfast is known for its murals and street art so this tour is a treat to see the beauty of the art and learn the passionate meanings behind the work. For the afternoon head over to city hall where you can take a free tour. It sounds odd to do but the Belfast city hall is stunning! You’ll then have time to stop by the Ulster Museum, the Crumlin Road Gaol, roam around the city and shop some more or head to the pub. DAY FOUR: If you’re a big Game of Thrones fan then this day should not be skipped. Get yourself on a tour so you can visit some of the best sites where the HBO show was filmed. Most of the sites are around Belfast. There are multiple tours, some of which take you to completely different filming locations, some have you dress up in costume and some even include a stop at the Giant’s Causeway. It’s best to look around and then decide which tour is best for you. Planning a trip to Ireland can be an overwhelming task with so many options and so many Ireland destinations that are worth seeing. But with this post you should now have a good idea of where to visit in Ireland and the best things to do in each stunning and exciting spot. Enjoy your holidays in Ireland and I hope this Ireland guide helped!